As a Shia, I always longed to go to Karbala in Iraq, as it is an important religious site for us. According to our beliefs, Imam Hussain is the third of the 12 Imams who was martyred along with his family (including his infant child and his companions) by Yazeed and his army in the battle of Karbala. The battle took place 1,500 years ago, and his martyrdom is mourned all over the world to this day. Imam Hussain wanted to spread the teachings of Islam and safeguard the religion by any means. Thus the battle of Karbala took place, and though Imam Hussain was defeated, his true victory lies in the fact that even 1,500 years later, his martyrdom is mourned like no other. 2018 proved lucky as I visited the holy city during Arbaieen, the 40th day of Imam Hussain’s martyrdom. 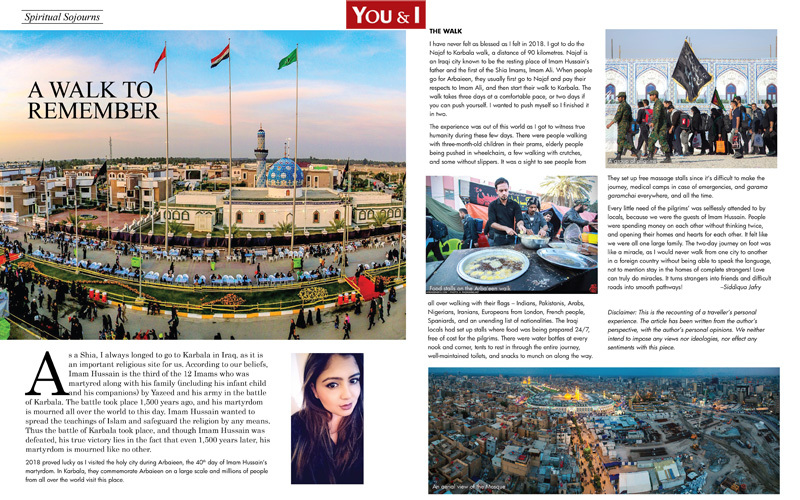 In Karbala, they commemorate Arbaieen on a large scale and millions of people from all over the world visit this place. I have never felt as blessed as I felt in 2018. I got to do the Najaf to Karbala walk, a distance of 90 kilometres. Najaf is an Iraqi city known to be the resting place of Imam Hussain’s father and the first of the Shia Imams, Imam Ali. When people go for Arbaieen, they usually first go to Najaf and pay their respects to Imam Ali, and then start their walk to Karbala. The walk takes three days at a comfortable pace, or two days if you can push yourself. I wanted to push myself so I finished it in two. The experience was out of this world as I got to witness true humanity during these few days. There were people walking with three-month-old children in their prams, elderly people being pushed in wheelchairs, a few walking with crutches, and some without slippers. It was a sight to see people from all over walking with their flags – Indians, Pakistanis, Arabs, Nigerians, Iranians, Europeans from London, French people, Spaniards, and an unending list of nationalities. The Iraqi locals had set up stalls where food was being prepared 24/7, free of cost for the pilgrims. There were water bottles at every nook and corner, tents to rest in through the entire journey, well-maintained toilets, and snacks to munch on along the way. They set up free massage stalls since it’s difficult to make the journey, medical camps in case of emergencies, and garama garamchai everywhere, and all the time. Every little need of the pilgrims’ was selflessly attended to by locals, because we were the guests of Imam Hussain. People were spending money on each other without thinking twice, and opening their homes and hearts for each other. It felt like we were all one large family. The two-day journey on foot was like a miracle, as I would never walk from one city to another in a foreign country without being able to speak the language, not to mention stay in the homes of complete strangers! Love can truly do miracles. It turns strangers into friends and difficult roads into smooth pathways! Disclaimer: This is the recounting of a traveller’s personal experience. The article has been written from the author’s perspective, with the author’s personal opinions. We neither intend to impose any views nor ideologies, nor effect any sentiments with this piece.